In this project, my primary intention is to upgrade Mapknitter to Rails 6. Other small features are increasing test coverage and improving CI. Test Coverage - Tests are important since they will show specific errors and guide us to what is exactly wrong and where the code is failing. If we don't have tests covering a breaking change, it will take more time to track and understand the change, thus wasting time. (Relevant issue: #304) Currently, we have some basic unit and functional tests. The test coverage for mapknitter is currently at around 60%. I would aim to reach around 80% coverage before starting the upgrade. CI improvements - I shall set up Codeclimate which is really useful for code review and integrate it with travis. I will follow the Codeclimate documentation for this. I will also fix Dangerbot for code and PR review. (Relevent PR: https://github.com/publiclab/mapknitter/pull/306). I shall follow the documentation for this as well. Rails upgrade workflow - The idea is to roll out upgrades in as small pull requests as possible. We should upgrade rails to the closest target version each time for minimum conflicts and errors. 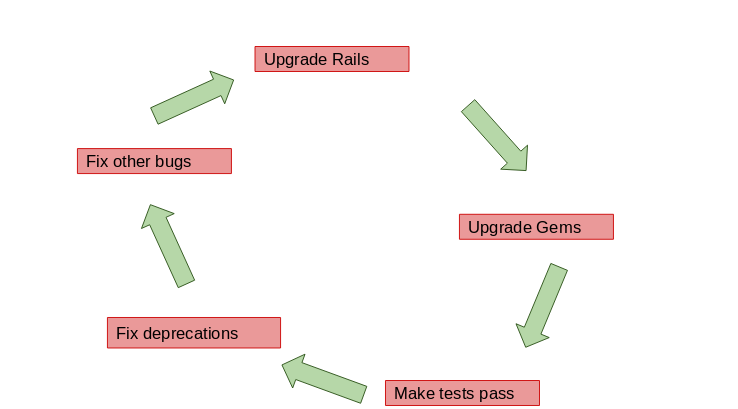 Upgrade Rails: First of all we should upgrade the rails gem to the closest target version. Update rails config: Once all the dependencies are installed and compatible with each other, we need to start updating the code. I will start by first fixing the config files. For this, we can use RailsDiff which shows the configuration changes between rails versions. Fix errors in test: Due to change in rails version, there is a possibility that the tests will encounter syntax and other kinds of errors. This needs to be fixed before running the tests. Run tests: Tests will be my primary way of finding out breaking points in the code. I will be fixing the code until all the tests pass. Useful reference guides during this process will be the Upgrade Guidesand Release Notes., which are amazingly documented. Finding and fixing bugs not covered by tests: Since our tests suite might not cover everything, It is possible to encounter unexpected bugs. For this we can implement the upgrade to the unstable branch for testing before merging it to main. We can take help from the community for testing the upgrade. I will write tests for any such bugs found and then proceed to fix them. Community Bonding Period (May 6 - May 27): During this time, and prior to this,I will be performing the prerequisites for the Rails upgrade mentioned above. Week 2: Upgrade to Rails 4.2 - Fix tests, Fix deprecation warnings and other bugs. Week 3: Upgrade to Rails 4.2 - Fix tests, Fix deprecation warnings and other bugs. Week 6: Upgrade to Rails 5 - Fix tests, Fix deprecation warnings and other bugs. I have been working on Ruby on Rails for around a year and a half (Check out my github repos!). Also I have been working as a backend developer with a startup for around 9 months. Currently, most of the medical records in India are handwritten and thus decentralized. We aim to provide a platform that used technology to make healthcare in India easier. i have gathered considerable skill in the Rails, Docker, and Devops while working here. Contribution Tracker- I made this project for Zense as a kind of scoreboard for tracking contributions. It uses the github api to track commits, prs and issues to the organization. Twitter Clone- Twitter implemented using Django as part of my semester project with 2 other classmates. I'm an active part of our college developers' club Zense. Zense tries to promote learning through team projects and sessions. We use software to try and fix problems in our college and society. Here's a link to our github page. I'm really interested in Public Lab. The thing that amazes me the most about this organization is how welcoming and empowering this community is! I'd love to work with Public Lab and help the Open Source Community grow. My project is targeted towards the entire publiclab community. Upgrading rails will ensure rolling out new features will be less time consuming and easier. Upgrading rails is a great benefit for everyone! I understand that it is a serious commitment and I shall be spending around 5-6 hours of work daily for this project. Hey @warren here's my first draft of the proposal. It would be great if you could review it! Also, I'm a bit skeptical about the timeline. I think 3 months might be too much for the upgrade? Should I add a few small subprojects as well? Thanks! Actually the biggest advice I could give is to look through @souravirus's posts and work over the last summer's SoC -- taking the plots2 project from Rails 3.x to Rails 5.x! These may include other upgrades such as further work on Yarn, changing the asset pipeline setup, all kinds of things. Thanks for a great proposal!! !